Wedding is that amazingly memorable day that everybody captures in their memory, with you, in case you are the one who is tying the knot, as the strongest guardian of such a pleasant memory. Deciding on the dress, food, venue, guest list and everything is equally important. However, the choice of decisions doesn’t end here. There is one more important one to make for your wedding and that is the choice of flowers that you should have in your wedding. It is something that is worth taking time to think about, after all your bouquet is going to be in most of your wedding photographs making you look beautiful! Choosing to use seasonal flowers in your wedding arrangements can help you incorporate the natural beauty of the season. It has an additional advantage and that is saving on the total cost of your wedding flowers for you are not ordering flowers that are not seasonal and so no special arrangements have to be done to get those. Best advice is to consult a professional florist for he knows exactly when different flower types come into season. He or she is an expert at integrating cost-effective and seasonally-appropriate flowers into your wedding day and the overall design of the venue, including your special bouquet. Spring, summer, fall or winter, no matter what the season, the result will be breathtaking. If you want to do a survey on your own, you can look up the internet or hover in the market to know what flowers are in for the current season. Roses are known as the classic wedding flowers. There is a vast variety of roses, each available in different colour shape, and size. The best thing about roses is that they also differ from wonderfully fragrant varieties to having practically no smell at all. A great variety of colours are available from red through to yellow, pale green, white and near black. You may also want to create a romantic feel to your wedding by having a rose wedding theme. A piece of advice: White rose is considered as the ultimate wedding flower. However, you may as well want to consult your florist which will be best for you. Yet another wedding favourite flower is tulip. With over 500 varieties of cut tulip available, there is plenty of choice to be made from. You can see tulips in wedding all year round. Although the traditional time to expect these flowers is spring, commercial growers have extended the times and so these flowers are available to florists in off-seasons including winter and summer. If you want to add a touch of elegance in your wedding then cymbidium orchids are your way to go. They make beautiful wedding bouquets. Although the flower heads look delicate and may seem like they will wilt away sooner than you know it, they are in fact amazingly robust. They can withstand a certain amount of handling and once cut, they can usually survive several days without water before wilting. This makes them perfect if you are worried that you are getting married late on a hot summer’s day, and your bouquet flowers will be unable to survive. Go for orchids to save yourself from this misery. Gerberas, or Gerber daisies, come in a wide range of colours to choose from and are available all year round. This is indeed great news for brides as these are often ranked amongst the most beautiful of flowers everywhere in the world. They are also known as Gerber daisies in some parts of the world. 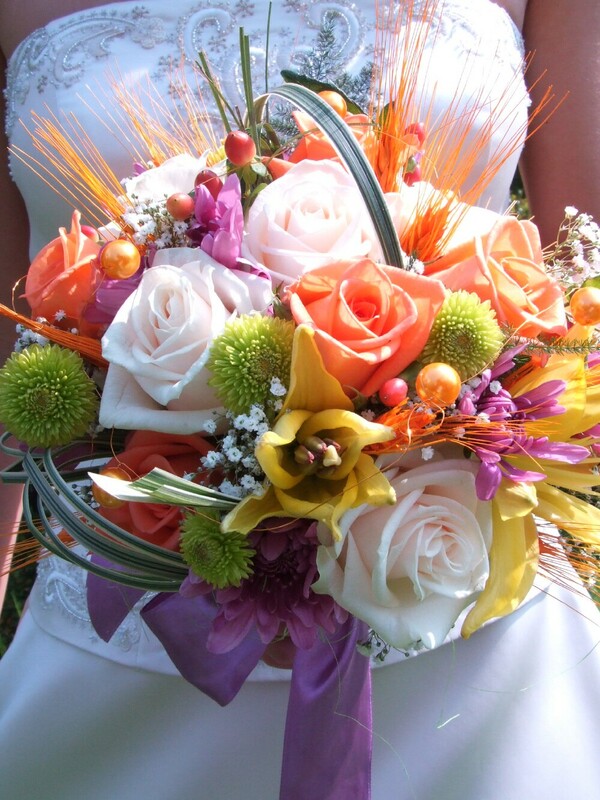 They work well in bouquets and also make great arrangements throughout the wedding venue. They are known best for table arrangements specifically. Nowadays Hydrangeas have become an increasingly popular choice of wedding flowers. They work particularly well in retro themed weddings. Vintage is yet another perfect time for Hydrangea flowers arrangement. Hydrangeas are elegant, beautiful and stylishly exquisite on their own but work equally well when mixed with other flower arrangements. They are available in a variety of colours from spring through to autumn. When the talk is of the Calla lilies, it is said that they have a sophisticated elegance about them that is unmatched to any other. Specifically, white callas are very popular for weddings, like white roses, but there is a wonderful range of colours available for you to choose from. Yet another great idea to go with calla lilies is that you could use a whole arrangement of callas at your wedding venue along with stylish accessories made out of calla lilies to call it a ‘Calla Lily themed wedding’.